Key developments last week in Africa include the fighting in Libya; the high intercommunal violence in Burkina Faso; the escalation threats in CAR; and the instability in Mozambique, Ethiopia and Northern Africa. In Libya, General Haftar on April 3rd ordered troops of the Libyan National Army (LNA) to advance on the capital, Tripoli, triggering clashes with forces of the UN-backed Government of National Accord (GNA). At least 12 battles and four airstrikes (by the GNA) were reported over the first three days of the violence at all edges of Tripoli – in the Azzawya, Al Jabal Al Gharbi, Aljfara and Almargeb subdistricts. The LNA rapidly seized key towns including Gharyan, Al Aziziyah and Tarhuna, as well as the Tripoli International Airport and a checkpoint fewer than 30km west of Tripoli (although the GNA recaptured the checkpoint the next day). The fighting continued to escalate after April 6th, bringing some shadows to the recent advances on the political stage. These include the first local elections held in nine municipalities since 2015; and the UN’s planning of a National Conference between the parties mid-April to agree on a unity government. At the same time, it could be a way for Haftar to further assert its position before the talks, emboldened by its recent major gains in the Murzuq and Sebha districts in the South against Tabu militias and Chadian armed groups (the LNA seized dozens of key towns and oil fields in the South in operations since mid-January). In Burkina Faso, intercommunal violence quickly escalated last week in the Arbinda department of Soum province (Sahel region). On March 31st, presumed militants of the Group for Support of Islam and Muslims (JNIM) and/or Islamic State (ISGS) assassinated a religious leader and at least three of his family members. This triggered two days of violence, mostly attacks by Koglweogo and ethnic Foulse and Mossi militias against Fulani communities. The violence left at least 69 people killed, though the toll is expected to rise. JNIM abducted four Foulse people on April 2nd as a result of the violence. The security forces also intervened, executing 13 Fulani men who were escaping and arresting members of a Fulani village after a Koglweogo assault on April 4th. The violence comes amidst a rapid spread of the Islamist violence in Burkina Faso in recent months (and in the Sahel more generally), which has led to massive spikes in the violence targeting ethnic communities perceived to support the government or the militants. In the Central African Republic (CAR), there have been no major outbreaks of violence since the February peace agreement. However, the situation could quickly worsen considering the dissatisfaction of some signatories with the peace process and their continued involvement in sporadic incidents. Last week, the Union for Peace in the Central African Republic (UPC) clashed with a self-defense group in Zangba sub-prefecture in Basse-Kotto on April 3rd. The next day, they retaliated by attacking five villages in the area, killing at least 18 civilians. This was the deadliest incident recorded in CAR since November 15th, 2018, when the violence between UPC and Anti-Balaka escalated not far from Zangba, in Alindao town (Basse-Kotto), leaving 112 people killed, mostly civilians. Meanwhile, the tensions escalated again in the Baboua area of Nana-Mambere prefecture between the Democratic Front for the People of the Central African Republic (FDPC) and the MINUSCA after the ransoming of 11 vehicles by the FDPC. Other relevant developments in Africa last week span Mozambique, Ethiopia, and Northern Africa. In Mozambique, Ahlu Sunna Wal Jamaa (ASWJ) militants remain a dangerous threat to civilians in the Cabo Delgado province: they attack villages on a weekly basis, with regular reports of beheadings and organ cutting. Yet, the government’s response to the threat appears minimal and is failing to bring more clarity on the nature of the ASWJ threat: only three engagements between the state forces and the militants have been reported since the start of 2019, compared to at least 30 reported attacks against civilians. In Ethiopia, the split formalised on April 1st between Oromo Liberation Front (OLF) fighters and political party members highlights the failure of the peace agreement reached between the government and the OLF in August 2018 to address grievances within the Front holistically. This could lead to more fighting in the coming weeks in various regions. 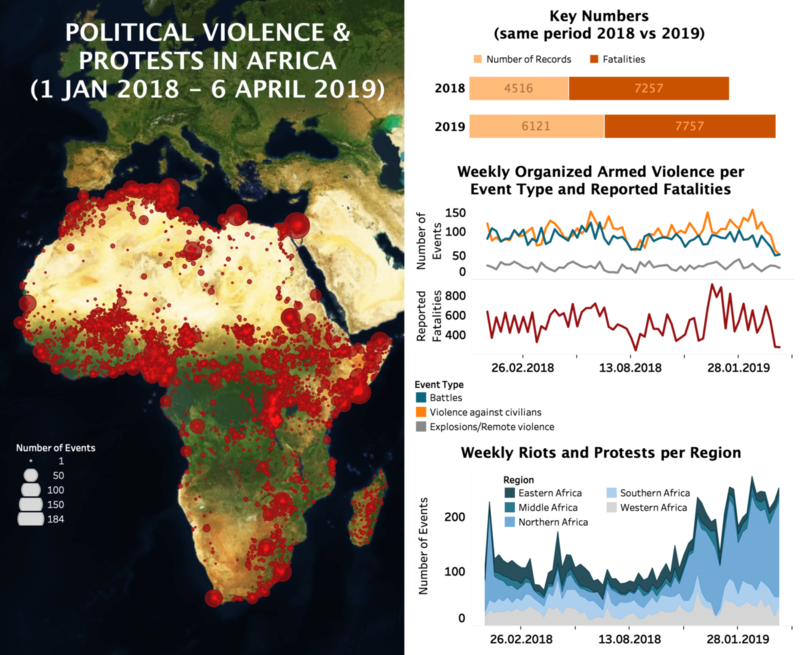 Lastly, protests and riots are nearing their highest levels in the ACLED dataset, largely driven by the unrelentingly large waves of demonstrations in Algeria, Sudan and Tunisia. In Algeria, the months of demonstrations have put significant pressure on the government, culminating in the resignation of President Bouteflika last week, on April 2nd. Yet, masses of people have continued to take the streets after Bouteflika’s resignation, calling for a wider reversal of the current regime. In Sudan, daily protests against President al-Bashir are also continuing and expanding. Hundreds of thousands of people took the street to protest the regime on April 6th, with two protesters killed. Over 500 protests and riots have been reported since the beginning of the movement in early December 2018 – this compares to only 209 such events in the whole of 2018. Lastly, last week, in Tunisia, protests erupted nationwide over fuel price hikes – the same development that triggered the wave of demonstrations in Sudan.